Industrial production increased by 10.5% YoY and remains in line with market expectations but the slowdown in the speed of car production might become a cause for concern next year? Industrial production accelerated by 10.5% year-on-year in October, which was in line with market expectations. However, as with other October statistics, year-on-year dynamics were affected by a higher number of working days. Taking this into account, October industrial growth reached 5.3%, which is close to the average 2017-growth. 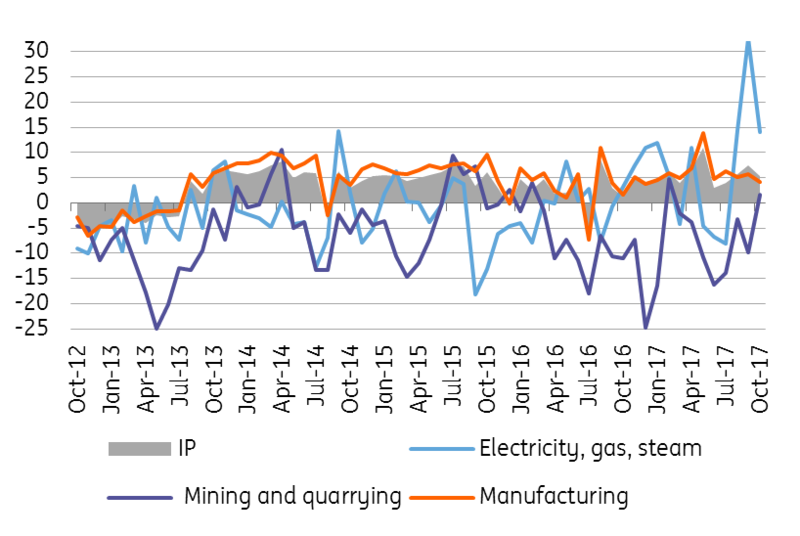 Last month, strong industry growth (after adjusting for the working day bias) was partly driven by energy production, which increased by 31% YoY, mainly due to last year’s shutdowns in nuclear power plants causing the low comparison base. This effect was still visible in October, but partially die out as energy production add "only" 15% YoY. The manufacturing industry itself rose by 10% YoY in September but decelerated to 4.1% YoY after adjusting for working days. This is well below the year-to-date average growth of 6%. New orders picked up by 10% YoY in October, both as a result of growth in domestic as well as foreign orders. However, car production new orders slowed down to 3% compared with 7% September growth, despite the positive effect of a higher number of working days. Overall, new orders in this industry's most important domestic segment have been slowing down this year while their growth was double-digit in the past few years. 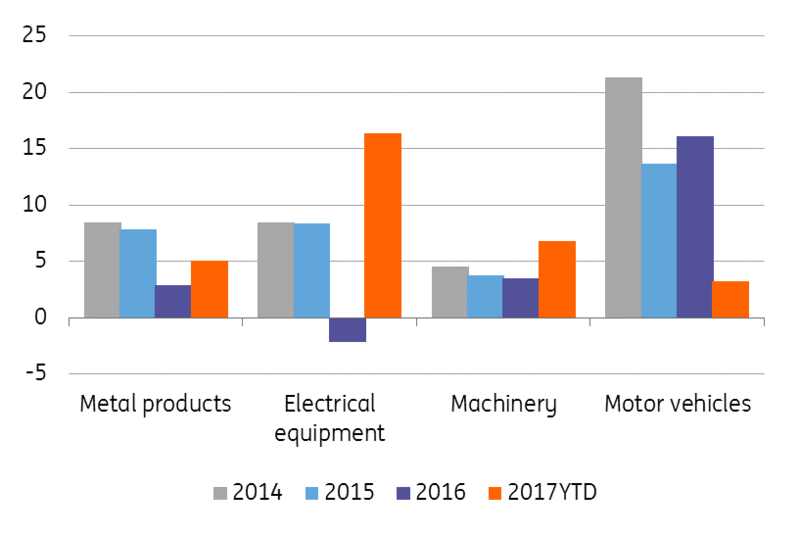 Although industrial production was in line with market expectations in October, development of the manufacturing sector ended below the average 2017 growth. The weaker dynamics may be related to the weaker performance of the German industry in October, which ended below the market expectations. Given the favourable forward-looking indicators and new orders, Czech industrial production growth should remain favourable, although year-on-year dynamics may weaken as a result of a high base. The question withstanding is also the speed of slowdown of car production, which is partially visible due to the high base, but might become more pronounced due to lower dynamics of new orders. As such, we expect industrial production to slow down close to 3.5% next year after favourable 5.5% annual dynamics experienced in 2017.